Mycoplasmas are present worldwide in a large number of animal hosts. Due to their small genome and parasitic lifestyle, Mycoplasma spp. require complex isolation media. Nevertheless, already over 100 different species have been identified and characterized and their number increases as more hosts are sampled. We studied the applicability of amplified rDNA restriction analysis (ARDRA) for the identification of all 116 acknowledged Mycoplasma species and subspecies. Based upon available 16S rDNA sequences, we calculated and compared theoretical ARDRA profiles. To check the validity of these theoretically calculated profiles, we performed ARDRA on 60 strains of 27 different species and subspecies of the genus Mycoplasma. In silico digestion with the restriction endonuclease AluI (AG^CT) was found to be most discriminative and generated from 3 to 13 fragments depending on the Mycoplasma species. Although 73 Mycoplasma species could be differentiated using AluI, other species gave undistinguishable patterns. For these, an additional restriction digestion, typically with BfaI (C^TAG) or HpyF10VI (GCNNNNN^NNGC), was needed for a final identification. All in vitro obtained restriction profiles were in accordance with the calculated fragments based on only one 16S rDNA sequence, except for two isolates of M. columbinum and two isolates of the M. mycoides cluster, for which correct ARDRA profiles were only obtained if the sequences of both rrn operons were taken into account. Theoretically, restriction digestion of the amplified rDNA was found to enable differentiation of all described Mycoplasma species and this could be confirmed by application of ARDRA on a total of 27 species and subspecies. Mycoplasmas are phylogenetically related to gram-positive bacteria with low GC-content and belong to the class of the Mollicutes. They form a unique group of bacteria that lack a cell-wall and that contain sterols in their cytoplasmatic membrane. They are of great importance, since several species are pathogenic to animals or humans, whereas species of other mollicute genera also infect plants and insects . In addition, a series of mycoplasmas cause trouble in the laboratory, because they infect cell cultures. Already over 100 species have been described, and their number, as well as the number of different hosts is still increasing. A correct identification of mycoplasmas, mostly performed after a fastidious initial isolation, may be achieved by various methods. Original tools to identify mycoplasmas were mainly based on biochemical and serological differentiation, varying from simple precipitation tests , to ELISA [3, 4], immunofluorescence , or Western blot analysis . These techniques are being replaced by faster DNA-based tools . Many of these methods are based on the 16S rDNA sequence for various reasons. 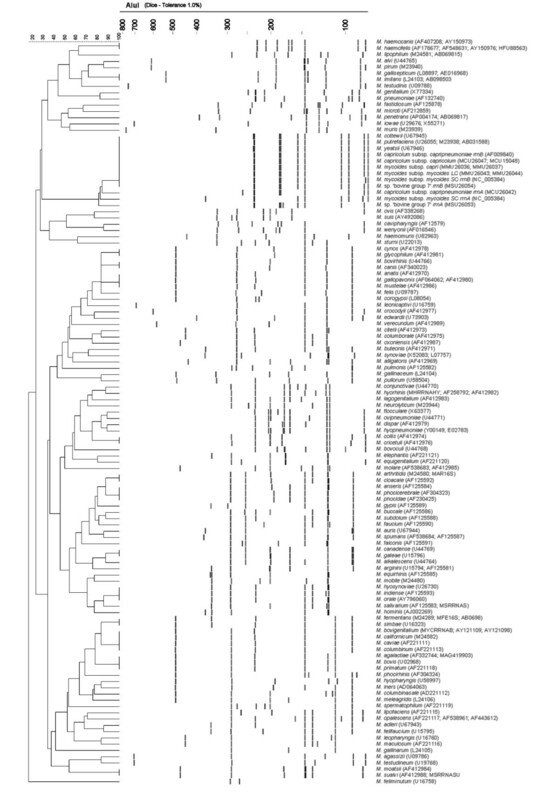 First, the 16S rDNA has been sequenced for all recognized Mycoplasma spp. and is required when describing a new species . Secondly, the 16S rDNA sequences have lower intraspecific variability than most protein encoding genes, hence their use in the construction of phylogenetic topologies . Recently, denaturing gradient gel electrophoresis of amplified 16S rDNA was shown to be useful to differentiate most Mycoplasma spp. . In another approach, correct identification of related Mycoplasma spp. was based on differences of the 16S-23S intergenic spacer (ITS) region. Both size variation  as sequence differences [11, 12] of the ITS were successfully used to differentiate related species. Compared to the 16S rDNA sequence, ITS sequences may vary more between strains of the same species due to a lower selection pressure , although reports of very highly conserved ITS regions are known as well . 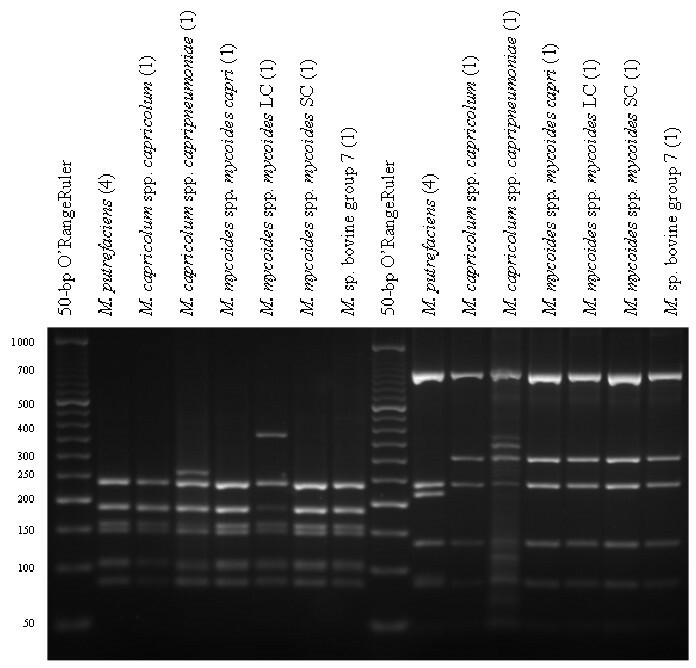 Amplified rDNA restriction analysis (ARDRA) has already been used for the identification of some avian species [15–17] as well as for pathogenic mycoplasmas in cats . Restriction analysis with PstI of an amplified 16S rDNA fragment was also shown useful to differentiate M. capricolum subsp. capripneumoniae from the other species belonging to the mycoides-cluster . The potential and power of ARDRA to identify members of the Mollicutes was already put forward , but was never worked out in detail for a large number of species. In this study, we investigated the value of ARDRA to identify all (to date) recognized Mycoplasma spp. A total of 60 strains, belonging to 27 different Mycoplasma species and subspecies, were used during this study (Table 1). The Mycoplasma spp. belonging to the mycoides-cluster and the M. hyosynoviae strains, were kindly provided as purified genomic DNA samples by Dr. L. Manso-Silivan (CIRAD, France) and Dr. B. Kokotovic (DFVF, Denmark), respectively. All other Mycoplasma spp. were cultivated using F-medium , modified Hayflick medium , SP-4-medium , SP-4-medium supplemented with L-arginine, HS-medium , or Friis'-medium with ampicillin instead of methicillin . All isolates were previously identified using biochemical tests and growth precipitation tests with absorbed rabbit antisera . Whenever discrepancies existed between the obtained ARDRA-profiles and the serological results, the 16S rDNA was sequenced for an exact identification . DNA of growing cultures was extracted using a phenol-chloroform extraction described previously  or using alkaline lysis. For alkaline lysis, the cultures were centrifuged (2', 10000 g) and resuspended in 50 μl lysis buffer (0.25% SDS in 0.05 N NaOH). After 5' at 95°C, 300 μl water was added and the bacterial debris was centrifuged (2', 10000 g). One μl of the supernatant was used as template for amplification of the 16S rDNA. The universal primers pA (5'AGAGTTTGATCCTGGCTCAG) and pH (5'AAGGAGGTGATCCAGCCGCA) were used to amplify the 16S rRNA genes , yielding an amplification product of approximately 1500 bp. 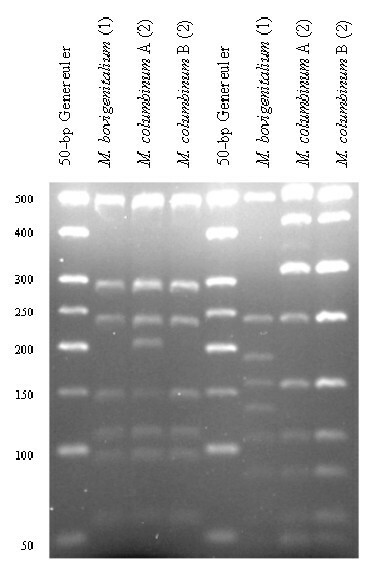 Thirty cycles (20" 94°C; 15" 57°C; and 30' 72°C) were run on a GeneAmp 9600 Thermal Cycler (Perkin Elmer, USA) using 3 U recombinant Taq DNA polymerase (Invitrogen, UK), 1 × PCR buffer (20 mM Tris-HCl, 1.5 mM MgCl2, and 50 mM KCl; pH 8.4), 10 pmol of each primer and 1 μl of the genomic DNA (~30 ng) as template. Reaction volumes were 50 μl. For all 60 strains, 10 μl of the 16S rDNA PCR product was digested with 5 U of restriction enzyme AluI (Fermentas, Lithuania; sequence: AG^CT) and the associated Y+/Tango restriction buffer (Fermentas) in a total volume of 20 μl for 2 hours at 37°C. For a final identification, the amplified 16S rDNA of some strains were digested in addition with BfaI (New England Biolabs, USA; sequence: C^TAG) or HpyF10VI (Fermentas; sequence: GCNNNNN^NNGC). The restriction fragments were separated on a 3% Nusieve 3:1 agar (Tebu-Bio, France) for 2 hours at 130 V and visualized using a GeneGenius gel documentation system (Westburg, The Netherlands). A 50-bp ladder was used as a DNA marker (Fermentas). ARDRA-profiles were calculated for all Mycoplasma spp. as acknowledged by the International Committee on Systematics of Prokaryotes (ICPS) to date. The 16S rDNA sequences were downloaded from Genbank (accession numbers are indicated in Figure 1). A consensus sequence was constructed and used for species for which more than one sequence was available. The M. orale 16S rDNA sequence was determined and submitted [Genbank:AY796060], since the only available sequence contained numerous ambiguities. For the members of the M. mycoides-cluster – for which differences between rrnA and rrnB have been published  – both sequences were used. For some Mycoplasma spp. only a partial sequence of the 16S rDNA was available. For these sequences, nucleotides were added to the 5' and/or 3' ends to generate fragments of expected length. These lengths and the choice of the nucleotides added were based on a 16S rDNA consensus sequence obtained by alignment of the complete Mycoplasma 16S rDNA sequences available in Genbank using Clustal W. The restriction sites and the exact size of the ARDRA fragments were calculated using Vector NTI Advance V9.0 (Invitrogen) and BioNumerics V3.5 (Applied-Maths, Belgium). Theoretical ARDRA patterns after in silico digestion with AluI for all currently recognized Mycoplasma spp. Patterns are clustered using UPGMA (Bionumerics V3.5) by way of illustration. The Genbank-accession numbers used are listed together with species name. By way of illustration, a dendrogram, based on ARDRA patterns, was constructed using the Unweighted Pair Group Method with Arithmetic Means (UPGMA) using 1% tolerance (i.e. bands that differ about 7 nucleotides or less are considered identical) and taking only fragments from 80 to 800 nucleotides into account. For all Mycoplasma spp., the theoretical AluI,BfaI and HpyF10VI restriction patterns were calculated [see Additional file 1] and are represented in Figure 1, 2, 3. For a number of species, ARDRA was carried out in the laboratory to confirm the in silico obtained results and to check the validity of the technique for identification. ARDRA profiles obtained with AluI and BfaI are shown in Figure 4 and Figure 5, respectively. For a further verification of the technique and for the remaining 9 species that could not be identified with AluI or BfaI alone, ARDRA was also performed with HpyF10VI (Figure 6, 7). Calculated ARDRA profiles of Mycoplasma spp. that can be differentiated using BfaI, but had undistinguishable AluI restriction profiles. Calculated ARDRA profiles of Mycoplasma spp. that can be differentiated using HpyF10VI, but had undistinguishable AluI restriction profiles. The restriction pattern of M. capricolum subsp. capricolum represents the not included members of the M. mycoides-cluster as well. 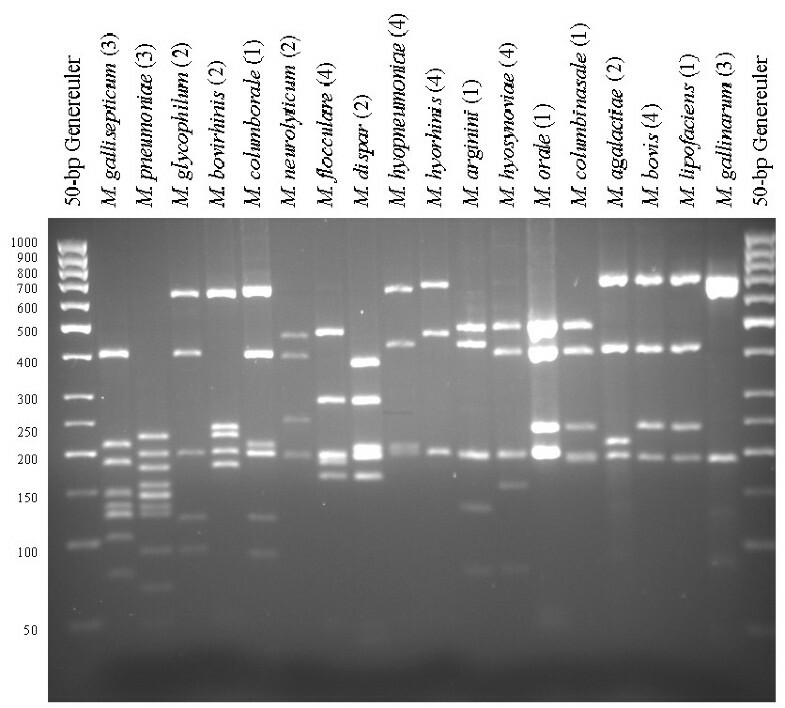 ARDRA profiles after restriction with AluI of 18 different Mycoplasma species. Since all samples of the same species gave identical restriction patterns, the number of strains tested for each species is indicated in parenthesis. A Generuler 50-bp ladder (Fermentas) was used as size-marker. ARDRA profiles after restriction with BfaI of 18 different Mycoplasma species. Since all samples of the same species gave identical restriction patterns, the number of strains tested for each species is indicated in parenthesis. A Generuler 50-bp ladder (Fermentas) was used as size-marker. ARDRA profiles after restriction with AluI (left) or HpyF10VI (right) of M. bovigenitalium and of M. columbinum. A Generuler 50-bp ladder (Fermentas) was used as size-marker. The number of strains tested for each species is indicated in parenthesis. ARDRA profiles of M. putrefaciens and the M. mycoides cluster after restriction with AluI (left) and HpyF10VI (right). The expected band sizes for both rrn operons are indicated in Additional file 1. An O'RangeRuler 50-bp ladder (Fermentas) was used as size-marker. The number of strains tested for each species is indicated in parenthesis. Two of the four M. columbinum strains showed an unpredicted ARDRA pattern after restriction with AluI. Since the sum of all bands was higher than the length of the 16S sequence, a difference between the 2 rrn operons was expected. This was verified by sequence analysis, which revealed an ambiguity at position 997 (i.e. position 1007 in the E. coli numbering), pointing to the presence of AGCT in one and AGTT in the other operon. As such, a restriction site for AluI in one operon will lack in the other operon and will lead to a mixture of ARDRA profiles. Also for the strains of the M. mycoides-cluster the published sequences of both rrn operons were taken into account . By superimposition of the restriction profiles of both rrnA and rrnB, the correct, expected profiles were obtained. However, a faint band of approximately 370 nucleotides was observed in the HpyF10VI restriction profile of M. capricolum subsp. capripneumoniae, indicating a partial restriction at position 1082 of the rrnA gene (Figure 7). For all other samples, profiles were identical to the calculated restriction profiles using only one consensus sequence of the Genbank entries. A few species could not be differentiated with the three suggested enzymes and for these, other enzymes were selected. M. cricetuli and M. collis, which have 16S rRNA operons that are 99.8% identical, can be differentiated using Hpy188III. This enzyme cuts the 16S rDNA of M. collis 7 times, while restriction takes place only 6 times in the 16S rRNA gene of M. cricetuli. Also the restriction enzyme EarI can be used, since it only restricts the 16S rRNA gene of M. cricetuli. The very related M. imitans and M. gallisepticum could be differentiated using MseI or HindII. The restriction enzyme BstUI could be used to differentiate the otherwise indistinguishable M. haemocanis (2 restriction sites) and M. haemofelis (3 restriction sites). The determined 16S rDNA sequence of M. orale was almost identical to the 16S rDNA of M. indiense and specific restriction enzymes, like BsaJI or EcoHI, were necessary to differentiate these species. In case of the very related members of the mycoides-cluster, the differentiation is more complicated and a whole series of restrictions are needed. 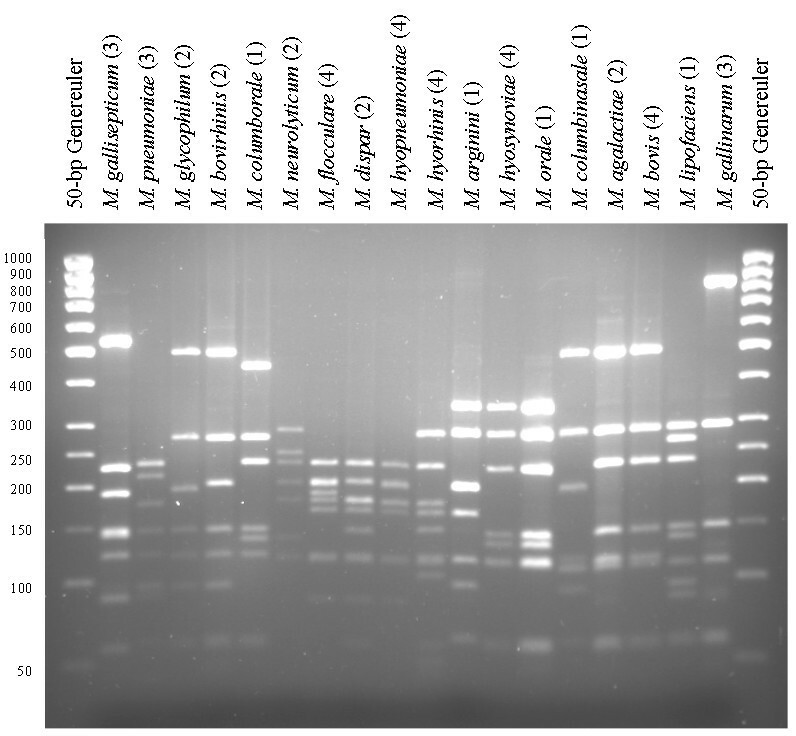 Based on the occurrence of different restriction sites, it is however theoretically possible to correctly identify these species as well, using only commercially available restriction endonucleases (Table 2). a Two values indicate differences between rrnA and rrnB, based on the Genbank accession numbers indicated in 1. Identification of mycoplasmas still largely relies on serological tests, but owing to the limited availability of quality-controlled sera, the high number of species, the serological cross-reaction between related species and the great variability in the surface antigens of different strains , newer techniques are needed. Sequence analysis of the 16S rRNA genes proved a useful tool to identify species, but the need for expensive equipment makes the technique less favorable for routine diagnosis. In this study, we showed that theoretically all Mycoplasma spp. are distinguishable using ARDRA. The in silico determined discriminative power was confirmed in the laboratory and even closely related Mycoplasma spp. could be identified correctly, as exemplified by the restriction with AluI and BfaI of M. agalactiae and M. bovis. We used universal primers to amplify the entire 16S rDNA to obtain a maximum discriminatory power. Working with universal primers implies that interference from other bacteria is to be expected when starting from clinical samples , especially when mycoplasmas are not abundantly present. The use of mycoplasma-specific primers binding to internal regions of the 16S rRNA genes may be helpful and result in a higher specificity as was already proposed by others [20, 30]. However, care must be taken since the discriminatory power will decrease if primers are chosen in such a way that less restriction sites are present in the amplification products. Alternatively, McAuliffe et al. proposed a selective enrichment step for 24 hours in Eaton's-medium before amplification of 16S sequences to identify Mycoplasma spp. Also Kiss et al. used ARDRA to identify three avian Mycoplasma species after 48 hours of incubation in Frey media. These suggested approaches may solve most problems, but may still be insufficient for mixed Mycoplasma cultures. The presence of more than one Mycoplasma species in clinical samples will lead to complex patterns, which are not easily resolved. Differences between rrn operons have been reported in several bacterial classes, but the level of sequence heterogeneity was recently shown to be lower than expected . It is therefore reasonable to assume that rrn operons tend to evolve in concert . For some bacterial species a high level of 16S rDNA sequence heterogeneity has been described [34, 35], while for Mycoplasma species, which possess no more than 2 rrn operons, only some micro-heterogeneity (i.e. scattered sequence variation between highly related rRNA genes) has been reported [27, 36, 37]. Besides, most differences between the two operons will not lead to altered restriction sites and will not influence the ARDRA patterns. In case a mutation is located within one of both restriction recognition sites, as was shown in particular for M. columbinum, restriction will most likely yield an unknown ARDRA profile, rather than lead to a false identification. Moreover, this aberrant pattern can be included in the identification scheme. The significance of the C1007T transition (E. coli numbering) present in two of the four M. columbinum strains is still unknown, but was shown in some strains of E. coli as well . Also, in agreement with an earlier report , many differences between the rrnA and rrnB sequences were observed for members of the M. mycoides cluster. 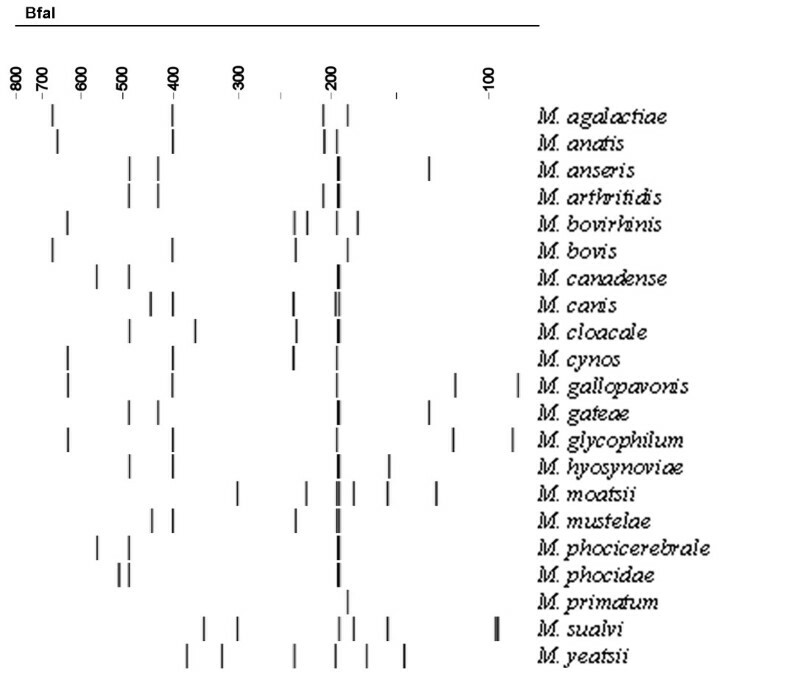 Nevertheless, the combined restriction profiles of both rrn sequences resulted in expected patterns with exception of a faint band seen for M. capricolum subsp. capripneumoniae after restriction with HpyF10VI. The reason for this partial restriction is unknown since purifying the PCR product, increasing the enzyme concentration, or lengthening the incubation period made no difference (data not shown). In any case, identification based on ARDRA was shown complex for these very related species and other techniques – like serological tests independent of the 16S rDNA sequences  – may be more suitable. However, the extra band visible for M. mycoides subsp. mycoides SC after restriction with AluI was shown sufficiently stable to be used for identification  and the value of ARDRA using PstI was also reported for M. capricolum subsp. capripneumoniae . Although the 16S rDNA sequences of these species may be almost identical, ARDRA is able to emphasize the few differences present without the need of extensive 16S rDNA sequence analysis or other tests [19, 38–40]. 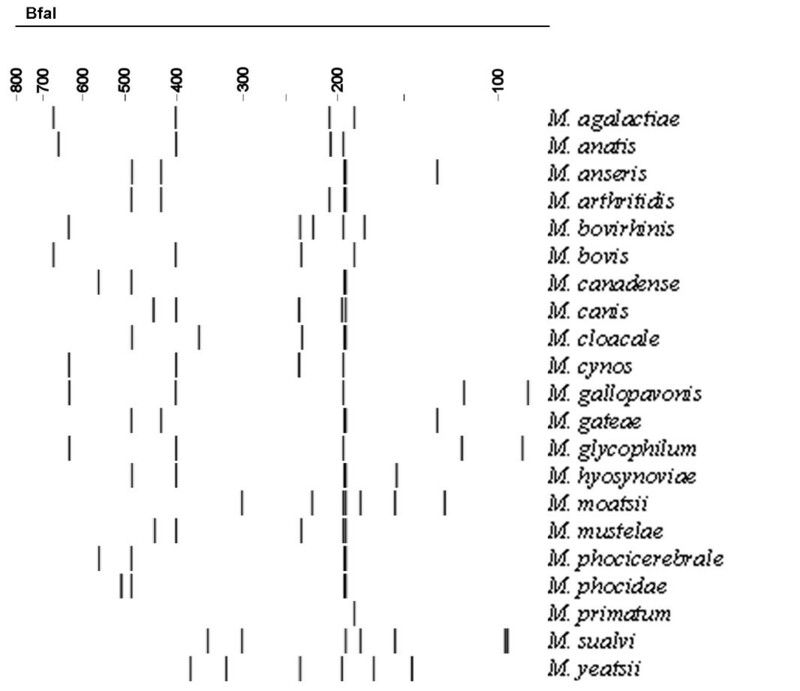 Also for other species with nearly identical 16S rDNA sequences (99.5% identity for M. haemocanis and M. haemofelis; 99.7% for M. gallisepticum and M. imitans; 98.9% for M. orale and M. indiense, and 99.8% for M. criteculi and M. collis), it was calculated that restriction analysis with a single additional enzyme would result in different restriction patterns and therefore to a correct identification. Restriction digestion with AluI of the amplified 16S rDNA can be used to differentiate between 73 of the 116 described Mycoplasma species and subspecies. An additional restriction with BfaI or HpyF10VI enables the identification of another 31 species and subspecies. Also the remaining 12 species can be differentiated, with the use of additonal enzymes, although other techniques may be preferred for some members of the M. mycoides-cluster. The simplicity and the general applicability of ARDRA make it possible to implement this technique in most laboratories with basic molecular biology equipment. This work was supported by a grant of the Federal Service of Public Health, Food Chain Safety and Environment (Grant number S-6136). The authors thank Sara Tistaert for skilful technical assistance. TS collected and analyzed most of the data and was principal writer of the manuscript. TDB participated in the initial in silico data analysis, while RV helped in the correct identification of the species. JV, PB, DM, JP, and AdK co-drafted the manuscript. FH participated in the discussion of the data, participated in proofreading and management. MV conceived the study and revised the manuscript critically. All authors made contributions, read and approved the final manuscript.